The latest news on the companies producing steel or raw materials used in the iron- and steelmaking process. A. Finkl & Sons is a leading supplier of forging die steels, plastic mold steels, die casting tool steels and custom open-die forgings, processing over 100,000 tons of steel each year. Finkl open die forgings are produced at its fully integrated production facility in Chicago. Acerinox, S.A. is a stainless steel manufacturing conglomerate group based in Spain. Altos Hornos de Mexico, S.A. de C.V. (AHMSA) is the largest integrated steel producer in Mexico. Headquartered in West Chester, Ohio (Greater Cincinnati), AK Steel is a leader in the production of flat-rolled carbon, stainless and electrical steel products, primarily for automotive, infrastructure and manufacturing, construction and electrical power generation and distribution markets. The company operates seven steel plants and two tube manufacturing plants across four states: Indiana, Kentucky, Ohio and Pennsylvania. Essar Steel Algoma is a fully integrated steel producer in Canada with a raw steel production capacity of approximately 2.8 million tons per year. The legacy of Algoma dates back to 1901. India's Essar Steel acquired Algoma in 2007. Allegheny Technologies Inc. (ATI), headquartered in Pittsburgh, Pa., is a specialty metals and components supplier for the aerospace & defense, medical, and industrial industries. Alloy Steel International Inc. (AYSI) is the parent company of Alloy Steel (Int) Australia Pty Ltd. AYSI was incorporated in Delaware, USA, in September 2000 and listed on the OTCBB in July 2001 and acquired 100% of the share capital of Alloy Steel Australia (Int) Pty Ltd in June 2001. Alloy Steel Australia (Int) Pty Ltd, is the manufacturer of Arcoplate. ANH Refractories is one of the world’s largest suppliers of refractory materials. It operates more than 17 production facilities spread over 3 continents and manufactures materials under the brands of A.P. Green, North American Refractories Company, and Harbison-Walker Refractories Company. Anshan Iron and Steel Group (Ansteel or Angang) is a steelmaker situated in Anshan, Liaoning Province, China. Aperam is a global player in stainless steel with 2.5 million metric tons of flat stainless steel capacity in Europe and Brazil. It came into being in 2011 as a result of ArcelorMittal's spin-off of its stainless steel business. Arcelor was created in February 2002 through the merger of Arbed (Luxembourg) founded in 1911, Aceralia (Spain) and Usinor (France). Arcelor had major steel production facilities in Belgium, Germany, Italy, Brazil and Argentina. At the time of the merger with Mittal Steel in 2006, Arcelor was the second largest steel producer in the world. It is now a part of ArcelorMittal. With 119 million tonnes of annual production capacity and 245,000 employees across 60 countries, ArcelorMittal is the world’s leading steel and mining company. It was formed in 2006 as a result of the merger of the Arcelor and Mittal steel groups. ArcelorMittal Dofasco is one of Canada's leading suppliers of steel products and iron ore to markets in North America and around the world, with extensive mining, steelmaking and tube manufacturing facilities in the provinces of New Brunswick, Quebec and Ontario. Arcelor acquired a controlling interest in Dofasco in 2006. ArcelorMittal USA is one of the largest steelmakers in North America. With 25 operations employing more than 18,000 across 12 states, ArcelorMittal USA provides a broad range of steel products serving the automotive, construction, pipe and tube, appliance, container and machinery markets. U.S.-based Arch Coal is one of the world's largest coal producers and marketers, with 140 million tons of coal sold in 2013. Its core business is supplying cleaner-burning, low-sulfur thermal and metallurgical coal to power generators and steel manufacturers on five continents. North Star BlueScope Steel is a 50/50 joint venture established in 1997 between BlueScope Steel and Cargill in Delta, Ohio. Bayou Steel was a U.S. producer of structural steel products with facilities in LaPlace, La., and Harriman, Tenn. ArcelorMittal acquired the company in 2006 for US$475 million. The mills are now known as ArcelorMittal LaPlace and ArcelorMittal Harriman. Beijing Shougang Cold Rolling Co.
Bethlehem Steel was one of the oldest American steelmaking companies. It declared bankruptcy in 2001 and was sold to the International Steel Group (ISG). What remains of the company is now a part of ArcelorMittal USA. Big River Steel, led by steel veteran John Correnti, plans to build a more than US$1 billion flatrolled steel mill in Mississippi County, Ark., to serve the automotive, oil and gas and electrical energy markets. BlueScope Steel is a flat steel producer with operations in Australia, Asia, New Zealand, North America and Pacific Islands. Qatar Steel Co. was formed in 1974 as the first integrated steel plant in the Arabian Gulf. Commercial production commenced in 1978 with the company becoming wholly owned by Industries Qatar in 2003. It has an expansive mill site in the heart of the progressive Mesaieed Industrial City — 45 kilometers south of the nation’s capital, Doha. It also operates a UAE based subsidiary, Qatar Steel Co. FZE. California Steel Industries (CSI) is the leading supplier of flat rolled and ERW pipe in the Western U.S.
CAP Acero operates through its subsidiary Compañía Siderúrgica Huachipato S.A. (CSH) which has integrated steel facilities in Talcahuano, Chile. Carpenter is a leader in the development, manufacture and distribution of cast/wrought and powder metal stainless steels and specialty alloys. It is headquartered in Wyomissing, Pa.
Cascade Steel Rolling Mills, a subsidiary of Schnitzer Steel Industries, is an EAF steelmaker producing rebar, coiled reinforcing bar, wire rod, merchant bar and other specialty products. Charter Steel, a division of Charter Manufacturing, is an integrated American supplier of carbon and alloy steel bar, rod and wire products with distribution and manufacturing facilities in Wisconsin and Ohio. China Gerui Advanced Materials Group Limited is a leading niche and high value-added steel processing company that utilizes advanced technology to produce specialty steel products in China. China Steel Corp. is the largest integrated steel maker in Taiwan. Cleveland Cliffs changed its name to Cliffs Natural Resources in 2008. Cliffs Natural Resources Inc. is an international mining and natural resources company headquartered in Cleveland, Ohio. Before 2008, it was known as Cleveland Cliffs. Commercial Metals Company (CMC) is a global, low-cost metals recycling, manufacturing, fabricating, and trading enterprise. Originating in 1915 with a single recycling location, it has progressively moved into higher value downstream segments of the steel value chain and is now a vertically integrated company. With corporate headquarters in Irving, Texas, today it operates in four primary business segments at over 200 locations and in more than 20 countries. 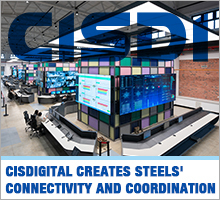 Companhia Siderúrgica Nacional (CSN) is a flat rolled steel producer in Brazil. Its main production facility is located in Volta Redonda, in the state of Rio de Janeiro. Companhia Siderúrgica do Pecém (CSP) was incorporated in 2007 with the single purpose of promoting the expansion of the steel industry in Brazil. Its first shareholders were Brazilian company Vale and South Korean Dongkuk. Three years later, in 2011, South Korea's POSCO became its third shareholder, establishing the joint venture which generated CSP. Deacero is a Mexican producer of long steel products. Severstal divested its North American assets in 2014. The Dearborn, Mich., mill and other assets were sold to AK Steel, and the Columbus, Miss., mill was sold to Steel Dynamics Inc.
Dillinger Hütte in Germany is Europe's leading heavy plate producer. Dongkuk Steel is a Korean steel producer. Shoujang Jingtang United Iron & Steel Co.
Ellwood Group, Inc. is a family-owned, privately-held company that has been operating for over 100 years. Through growth and acquisition, EGI has become a major supplier of high-quality, engineered, heavy metal components to customers all over the world. Emirates Steel is the only integrated steel plant in the United Arab Emirates, utilizing the latest rolling mill technology to produce rebar, wire rod and heavy sections. Ereğli Demir ve Çelik Fabrikaları T.A.Ş. (Erdemir) is the largest flat steel manufacturer in Turkey. Essar Steel is a global steel producer with a footprint in India, Canada, USA, the Middle East and Asia. It has an annual capacity of 14 million tonnes, and aims to achieve a global capacity of 20-25 million tonnes. It has a significant presence in the key markets of Asia, Europe, Africa and North America. The company has specialized plants for value-added steel products such as pipes and plates and has a leadership position in the cold rolling, galvanizing and pre-coated segments. Essar Steel Minnesota is a 6-million-ton-per-year integrated pellet plant on the Mesabi iron range in north-east Minnesota. It includes a concentration plant and direct reduced iron plant. EVRAZ is a Russia-based, vertically integrated steel, mining and vanadium business with operations in Russia, Ukraine, the United Stated, Canada, the Czech Republic, Italy and South Africa. EVRAZ North America is a leading steel manufacturer with eight steel manufacturing and 18 recycling facilities across the U.S. and Canada. It produces more than 5 million tons of flat, long, and tubular steel products annually for major markets including infrastructure, energy, defense and rail. EVRAZ Stratcor, Inc. is a producer and supplier of vanadium alloys and chemicals, which are used by the steel, chemical, titanium, and turbine-coatings industries to improve their products and/or processes. The company's headquarters, plant, and technology center are located in Hot Springs, Ark., while the company's technical-sales organization is located in Chicago, Ill.
Felman Production, LLC is a West Virginia-based producer of high-quality ferrosilicomanganese. Gallatin Steel is a joint venture between ArcelorMittal and Gerdau Ameristeel. Its flat steel manufacturing facility is located along the banks of the Ohio River in Gallatin County, Ky., USA. General Steel, headquartered in Beijing, China, produces a variety of steel products including rebar, high-speed wire and spiral-weld pipe. The company has operations in China's Shaanxi and Guangdong provinces, Inner Mongolia Autonomous Region, and Tianjin municipality with 7 million metric tons of crude steel production capacity under management. Geneva Steel was an integrated steel mill in Utah. U. S. Steel owned the facility from 1946 to 1987. Gerdau, headquartered in Brazil, is a leading producer of long steel in the Americas and one of the largest suppliers of special steel in the world. With over 45,000 employees, it has industrial operations in 14 countries - in the Americas, Europe and Asia - which together represent an installed capacity of over 25 million metric tons of steel per year. Gerdau Special Steel North America is an engineered bar producer headquartered in Jackson, Mich., with worldclass steel manufacturing mills in Jackson, Mich.; Monroe, Mich.; and Fort Smith, Ark. ; and metal processing facilities in Huntington, Ind. ; Pleasant Prairie, Wis.; Lansing, Mich.; Canton, Ohio; and North Vernon, Ind. Grupo SIMEC has a total of 19 steel production and processing plants: 11 in Mexico, seven in the United States and one in Canada. Gruppo Riva is a privately-held Italian steelmaker. It has two production units: the Ilva plant in Taranto, Italy, and Riva Acciaio. Hamilton Specialty Bar (2007) Inc.
Industrias CH (ICH) is a Mexican steel production and processing company. It is one of the main producers of special bar quality (SBQ) steels in North America, and of merchant and structural shapes in Mexico. Keystone Steel & Wire Co.'s Bartonville, Ill., campus is one of the largest wire mills in the world with over 2 million square feet of manufacturing space on over 1,000 acres. It has an annual steelmaking capacity of over 700,000 tons. Yong Steel Group Co. Ltd.
04 Apr 2019 - As it aims to further expand its overseas operations, Nippon Steel & Sumitomo Metal Corp. has officially changed its name to Nippon Steel Corp.
04 Apr 2019 - NLMK Group is progressing on installation of a new RUB4.4 billion (US$67.5 million) reheat furnace at its Lipetsk plant in Russia, the steelmaker said on Wednesday. 04 Apr 2019 - Salzgitter AG and Tenova have agreed to work together on a project that eventually will shift Salzgitter’s production route away from blast furnaces.